Kalamazoo, MI September 21, 2017 – The Kalamazoo Symphony Orchestra is excited to present the first Family Discovery concert of the season in collaboration with Classical Kids LIVE!. The KSO’s Family Discover Series concerts feature symphonic performances specially tailored to young children and their families. Tickets are only $5 each! Maestro Brier will be conducting the program entitled – Gershwin’s Magic Key. The story tells of a chance meeting on the streets of New York City between a poor newspaper boy (Lance Newton) and the great American composer, George Gershwin (Elic Bramlett). The orchestra magically weaves Gershwin’s greatest hits into the drama as the master composer shares historical anecdotes about his life and musical passion. A bonding friendship develops as they explore the vast melting pot of American music and discover the key to unlocking the boy’s own musical potential. Family and student audiences will be captivated by over twenty of Gershwin’s most popular compositions from classical compositions including Porgy & Bess, American in Paris, Cuban Overture, Concerto in F and Rhapsody in Blue to popular hits from the American Songbook including I Got Rhythm, Swanee, Someone to Watch Over Me, and Fascinating Rhythm. The Family Discovery activities will kick off at 2pm with the KSO’s popular Instrument Petting Zoo and Meet the Conductor. Updated July 2017. Please disregard all previous materials. Paul serves as Executive & Artistic Director of Classical Kids Music Education, a non-profit arts organization focused on introducing children (and their parents) to the lives and musical masterpieces of the great classical composers. A BFA in theatre from the University of Illinois Urbana-Champaign and professional experience as an actor, singer, dancer, director, choreographer and stage manager have enabled Paul to achieve success with Classical Kids LIVE! programming - the “gold-star” leader in the field for creating theatrical family concerts presented by professional symphony orchestras throughout North America and abroad. Production titles include Beethoven Lives Upstairs, Mozart’s Magnificent Voyage, Vivaldi’s Ring of Mystery, Tchaikovsky Discovers America and the brand new, Gershwin’s Magic Key - the first-ever symphony concert production that introduces new generations to the extraordinary legacy of the great American composer, George Gershwin. Elic is excited to be playing George Gershwin in the new Classical Kids LIVE! Production, Gershwin’s Magic Key. After joining Classical Kids during the 2005-06 season he has toured the US, Canada and Malaysia playing Mozart. A native of Phoenix, AZ, Elic now makes his home in the suburbs of Chicago. Stage credits include: The Music Man at Marriott Lincolnshire, Stage Kiss and The Boys are Coming Home at The Goodman; Western Civilization at Noble Fool; Teapot Scandals, Elegies, Sweeney Todd, Macabaret, Hereafter, and Three Sisters at Porchlight; The Musical Comedy Murders of 1940, Charlotte's Web, and Cinderella at Drury Lane; The Bomb-itty of Errors at The Royal George; and Saturday Night with Pegasus Players. In Forever Plaid, he has played the roles of Jinx, Frankie, and Sparky at several theatres including Chicago's original Royal George production. Elic also makes his living as a TV/Film actor, voice over talent, and as a director, producer, and teacher in the Chicagoland area. He would like to dedicate this performance to his loving and supportive wife Carrie Beth, and their beautiful children, Pearle and Theodore. 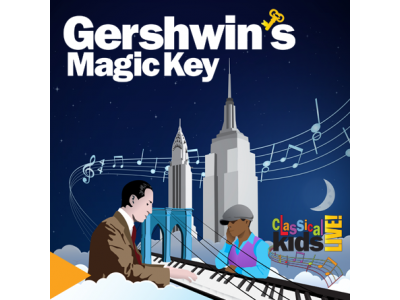 Lance feels truly honored to be part of Classical Kids and featured in their newest production, Gershwin's Magic Key. A native of Las Vegas, NV, Lance has been residing in Chicago, IL where he has worked with many theaters including, Steppenwolf Theatre for Young Adults and Chicago Shakespeare Theatre. Some Chicago credits include: Animal Farm (Steppenwolf Theatre); Othello Remix (Chicago Shakespeare Company); Marvin Gaye Story (Black Ensemble Theatre); Southbridge (Chicago Dramatists); Six Stories Tall (Adventure Stage); and Princess and the Pea (Chicago Kids Company). TV credits: NBC's- Chicago Fire and USA's- Sirens. Lance is a proud member of Actor's Equity Association and SAG-AFTRA and received his BFA from Viterbo University in La Crosse WI. He thanks his friends and family for their support and his girlfriend for her faith and loving friendship. The KSO will perform Gershwin’s greatest works as the master composer shares historical anecdotes about his life and musical passion in this story of a poor newspaper boy’s encounter with the great American composer, George Gershwin. A bonding friendship develops as they explore the vast melting pot of American music and discover the key to unlocking the boy’s own musical potential.